Cricket is in the T20 day and age where every batsman looks to hit sixes. This was recently evidenced by M. Shahzad smashing knock off 74 balls in 16 delivers in the T20 league. If we go a little into the past, Rohit Sharma “264” against Sri Lanka in an ODI comes up. To give you some context, in the 80s and 90s, “260” was a hard score to chase in the ODIs. This trend to score fast can be seen with an increased run rate even in Test Cricket. So let’s look at some of the slowest Test innings has witnessed over the years. We start off with the Australian batsman Damien Martyn. While playing against SA in Sydney in 1994, he scored a mere 6 runs in 54 balls with a help of a boundary (edge) in his 106 minutes batting in the second innings of the third Test match. His strike rate in that innings was 10.16. Another similar inning, this time by England Bowler Stuart Broad who scored 6 runs (1 four) in 77 balls. He batted 137 minutes against the Kiwis in the second innings of the third Test match in Auckland in 2013. His strike rate in that innings was 7.79. This one comes from the 1979 Ashes, third Test match in Melbourne. England’s right-handed batsman Geoff Miller came into bat in a tough situation and scored just 7 runs in 101 balls while batting for 123 minutes. His strike rate in that innings was 6.93. We move to the Indian Subcontinent for this one, Mansoor Ali Khan Pataudi (India’s youngest cricket captain) went to bat against England in the second innings of the fifth Test match in Mumbai in 1973. He batted for 102 minutes but scored just 5 runs off 84 deliveries with a strike rate of 5.95. 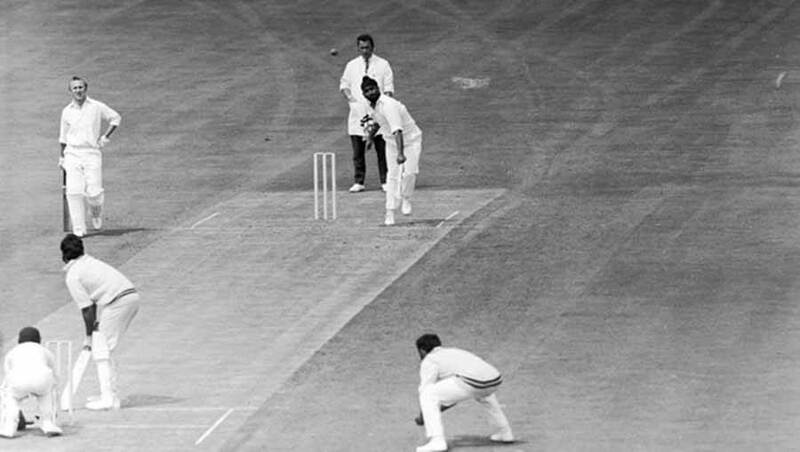 The slowest inning in a test match was played by Geoff Allott of NZ. He achieved this feat while batting against SA in Auckland in the first innings of the first Test match in 1999. He batted for 101 minutes, faced 77 balls and still got out on a duck. Many cricketers had got out on a duck on multiple occasion but to get out after 77 delivers with a strike rate of 0.00 is unmatchable. Next article Who is the oldest Person to become President of USA?